In the summer of 1934, Pearl Buck boarded a ship in Shanghai that was bound for America. She was forty-two years old, and had lived for thirty-four of those years in China, mostly in cities along the Yangzi River. Pearl and her first husband, John Lossing Buck, both taught at Nanking University, and lived in a house on the campus. In a small third-floor room, stealing hours from teaching, housework, and the care of her mentally disabled daughter, Buck wrote her first published work. Her second book, The Good Earth, the best-selling American novel of both 1931 and 1932, catapulted her overnight from obscurity and semi-poverty into international celebrity and wealth. A couple of years later, Buck determined to move permanently to the U.S. She had made the sorrowful decision to place her daughter in an American institution, and she wanted to live nearby. Her marriage had disintegrated, and she intended to re-marry in the States. She also knew that China was becoming increasingly dangerous. Japan, which had forcibly annexed Manchuria in 1931, and bombed Shanghai in 1932, would inevitably undertake a full-scale invasion. Buck left China with great reluctance. China had been her home. Fluent in both spoken and written Chinese, she had developed a deep affection for the country and its people, and had accumulated scores of friends. When she sailed from Shanghai in 1934, Buck took it for granted that she would be able to come back to visit the people and places she was leaving behind. History had other plans. Instead of bringing peace to China, Japan’s defeat in 1945 ignited four years of civil war between Nationalists and Communists. The Communist victory in October 1949 provoked a bitter response from the United States government, which refused to recognize Mao’s regime and banned all travel between the two countries. For more than two decades, neither Pearl Buck nor any other non-governmental U.S. citizen could legally set foot in China. Then, in 1972, in one of the most dramatic and consequential reversals in twentieth-century diplomacy, Richard Nixon traveled to China and shook hands with Mao, initiating a process of rapprochement that would ultimately lead both countries to normalized relations. In fact, Pearl Buck had never vilified or smeared the people of China. Probably no other writer on either side of the Pacific had done as much to rally American support for the Chinese throughout the 1930s and 1940s. But she had aroused the hatred of the Communist Party leadership. She had broadcast her anti-communism in her essays and novels, attacking internal Communist repression in such books as The Three Daughters of Madame Liang (1969), which told the truth about the Cultural Revolution when many on the Western left kept their eyes shut. She also denounced the Chinese invasion of Tibet in the novel Mandala (1970) and in a story called “The Commander and the Commissar” (1961). Gradually, between 1997 and 2012, Buck was treated with diminishing official hostility by the government. Her childhood home in Zhenjiang (or at least a reasonable facsimile of that home) was restored and opened to the public. So too, the cottage on Lushan, or Mount Lu, in which Buck and her family spent some of their summers. The Party’s motives were probably mixed. Particularly at the local and provincial level, there seems to be a greater willingness to take seriously Buck’s portrayals of China as part of the larger cultural history of the country and its twentieth-century relations with the West. Beyond that, and at a somewhat less abstract level, China has been keen to seize every opportunity to capitalize on potential tourist interest. 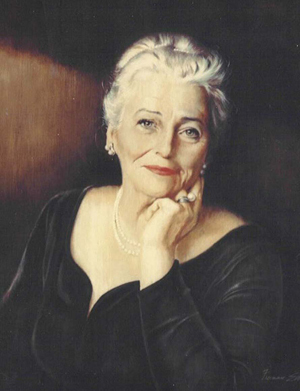 Finally, in May of this year, Pearl Buck was more or less rehabilitated. The faculty of Nanjing University gained approval and raised funds for the restoration of the campus house in which Buck had lived. Supervised by distinguished architects and historians, the renovations have been meticulously carried out. The re-opening of the house was marked by an international conference. Senior academics from a dozen Chinese universities gave papers on Buck’s life in China, her writing, and the controversies that have roiled the cultural waters around her for so many decades. Several Western speakers also participated, among them Hilary Spurling, whose recent biography of Buck was widely acclaimed; Donn Rogosin, a prize-winning filmmaker who has produced a documentary for public television on Buck’s life; and Janet Mintzer, president of Pearl S. Buck International, the agency that continues Buck’s humanitarian work with impoverished children and families throughout East Asia. I gave a talk on Buck and education. Chinese interest in Pearl Buck and her writing has been growing for some time. Two decades ago, when I was doing the research for my own Buck biography, I was told by a senior scholar of American literature that Buck’s books were “a treasure trove” of information about rural life in China in the early twentieth century—a period when China’s own writers generally neglected the lives of the farming families who made up 90% of the country’s population. In the twenty years since that conversation, scholars have published essays on Buck in Chinese-language journals, and have translated a dozen or so of her novels into Chinese. The spring 2012 symposium was thus the culmination of a long period of cultural recovery. Much of the energy behind the restoration of the Nanjing University house and the symposium came from the faculty of the university itself. Aside from offering what they consider a belated tribute to a writer and one-time colleague whose work they still find relevant, these scholars and administrators hope to put the house at the service of a broad range of East-West exchanges. In one of the symposium’s main events, university officials unveiled a life-size, half-length sculpture of Buck that has been installed in front of the house. Her significance has been, as it were, carved in stone. Once again, ideological considerations intruded on the occasion. Rejecting the more general conference title proposed by the organizers, “Pearl Buck and China,” Party apparatchiks insisted that the proceedings be called “Pearl Buck: the Nanking Years.” Fair enough, you might say: we were meeting to talk about Pearl Buck and the Nanjing house in which she lived. However, the dictated rubric was clearly intended to circumscribe discussion within acceptable limits. Just about all the trouble Buck stirred up in her opposition to Communist behavior occurred after she left Nanjing (and the country) on that boat from Shanghai in 1934. In other words, aside from offering a tale of some interest in itself, the fate of Pearl Buck and her reputation highlights the Chinese government’s continuing struggle to define its relation to its own people. Some discussion is sometimes permissible, but free discussion remains suspect. Brief periods of apparent liberalization alternate with longer periods of repression. A higher stakes saga of a more ancient contested figure offers another example of this institutional ambivalence. Confucius has long attracted vigorous Communist hostility. Mao condemned Confucianism as reactionary (as some Confucian teachings, for example on the place of women, surely are), and his prestige was under constant attack. Confucian images and temples were a favored target of vandalism during the Cultural Revolution. In what seemed to be the most dramatic symbol of Confucius’s rehabilitation, in January 2011, a thirty-one-foot bronze statue of Confucius was unveiled near Tiananmen Square—the Party’s most sacred real estate. No official explanation was provided, reducing observers to speculation. The favored hypothesis pointed toward a Party effort to enhance its own legitimacy by attaching itself to a sage to whom millions have remained loyal throughout decades of Communist denigration. Indeed, with his emphasis on harmony and deference to authority, Confucius might even be useful to a morally bankrupt regime that is willing to do whatever it takes to hold onto power. It all seemed to make sense. Then just four months later, as suddenly as it had appeared, the seventeen-ton statue was removed from Tiananmen and sequestered in the less prominent courtyard of the National Museum. As usual, officials had no comment, which, as usual, provoked more speculation. Perhaps the embrace of Confucius had gone too far; perhaps what is sometimes called the Maoist wing of the Party had successfully fought back. (The now disgraced Bo Xilai, at that moment promoting a Mao revival, was nearing the height of his influence.) Of course, if the statue re-appears, new explanations will have to be contrived. I intend to keep my eye on Pearl Buck’s statue, which is a reminder that in China the cultural is always political. In their different ways, and on different scales, both the public and the hidden debates over Pearl Buck and Confucius illustrate the difficulties the Party faces in making up its mind about the past and therefore about the future of the world’s most populous country.